Christians are called to be people who regularly explore the very basis of our faith - the word of God in Holy Scripture. While such exploration can, and should, be done individually and in families, there is much to be gained by joining for such explorations with fellow believers - for their perspectives and insights, and with the congregation's pastor - who is called to lead such studies. Below is a limited list of Bible study opportunities. It is "limited", because if all of our members were in Bible study groups, as each should, we would need more groups! What other studies would you like to see? 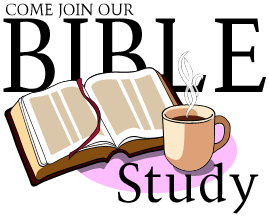 Pastor Honeycutt is leading a weekly Bible study Wednesdays at 10:00 am at the "office house." The study will be based on the upcoming scriptures for the next Sunday's service. All are invited to delve deeper into God's Word. "The Christian Faith" is a Bible study on the basics of our Lutheran Christian faith which can lead to membership at Redeemer Lutheran. Please call the church office (918) 341-1429 to speak with Pastor Honeycutt about this class. The LWML (Lutheran Women in Mission) meets at their regular times monthly and share a Bible lesson. One group meets on the third Thursday morning at 9:30 am, while the other meets on the fourth Monday evening at 7:00 pm. All ladies are invited to attend. For children-- SUNDAY SCHOOL continues Sundays at 9:00 am. We need your help in inviting and bringing more children to Sunday school! What we learn and share together during the Sunday school/Bible class hour is of eternal importance. As an added incentive there are good things to eat & drink at Sunday Morning Cafe beginning at 8:30 am for both adults and children. For adults and youth-- Please attend THE SUNDAY 9 A.M. ADULT AND YOUTH BIBLE STUDY led by Pastor Honeycutt. You are urged to take advantage of any of these opportunities for your children or yourself to be instructed in God's word! Prayer is a direction of life, a focusing of one’s most personal and deepest attention Godward. The purpose is to love God and learn to know Him so well that our wills, our actions, will be more and more aligned with His, until even our subconscious reactions and purposes will have the mark of His love and His life, about them. Prayer is no longer an “activity.” It becomes the continuing language of the relationship God designed to fulfill a human life. PORTALS OF PRAYER (quarterly) are available in the narthex. Please help yourself to one of these helpful devotional booklets. If you need one with one of the larger sizes of print, please contact the church office so that it can be provided for you. OUR CONGREGATION NOW OFFERS DURING-THE-WEEK E-MAIL “ENCOURAGEMENTS” FOR LIVING THE CHRISTIAN LIFE – Many have already submitted their response to this offer. If you haven’t, please get the simple pink form from Pastor Burger and submit it in the offering plate or through the church office. You are urged to take advantage of any of these opportunities for your children or yourself to study God's word in depth!